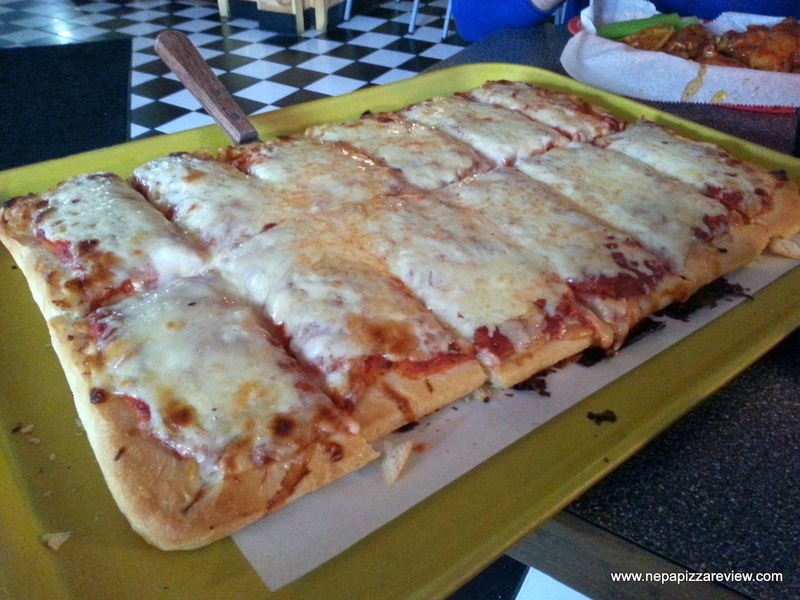 Perhaps one of the most challenging things for me to do is find a place to eat pizza, hang out, and watch sports on a Sunday or Monday here in NEPA. Many places are closed, many places who do have TV’s don’t have pizza, or aren’t known for their pizza, or places simply don’t publicize online that they have televisions available to watch sports on. This has become infinitely frustrating to me whenever I try to find a place that meets this description that I haven’t already reviewed. Luckily I have the best readers in the world, and the NEPA Nation bailed me out when I took to Twitter. I got a few good responses right away, most of which I have already reviewed, but there was one that I hadn’t yet tried – Town Tavern in Duryea. Several people had recommended Town Tavern through my drop box, but usually in the context of wings and pizza, rather than just pizza, but they serve pizza and I could watch some sports, so I was all over it! I met up with two buddies and we headed in. The place is pretty cool inside with a full bar, pool table, dining area, and most importantly televisions all over. We sat at a table with a giant screen TV overhead and watched our games. Since the tavern is known for its wings, we all made sure to grab an order – I went with medium, and of course we ordered a square pizza to try. Not long after placing the order, our wings were ready, and they were gigantic and unique. They seemed to have a two sauce system deployed, with a base sauce that was seasoned and clear (or brown), and a buffalo sauce which was drizzled over the top. These were unlike any wings I’ve had in the area and they were cooked to perfection, meaty, and excellent! We were all pleased with them and enjoyed their saucy goodness. I recommend you get these wings asap! Ok, back to the original point, how was the pizza?! 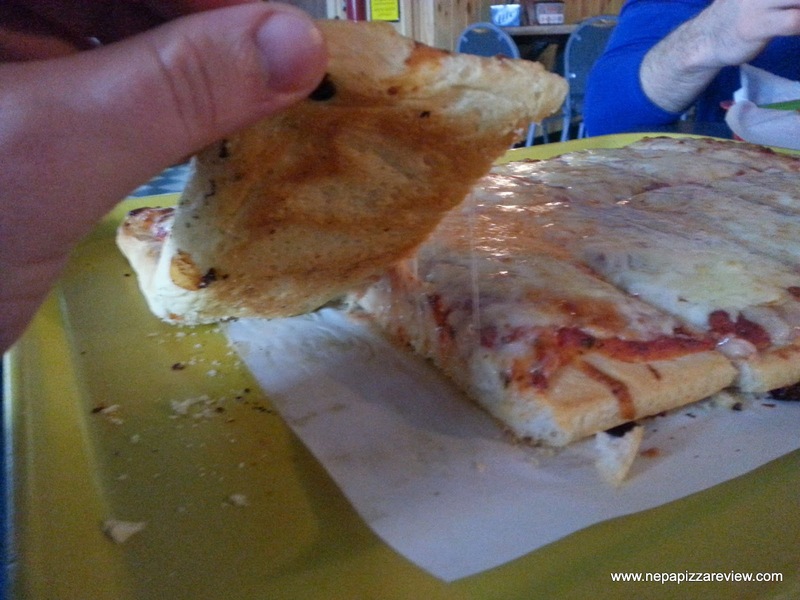 When the pizza came out, it was about what we expected – your standard tavern pizza made from a premade crust, hearty sauce and a blend of cheeses. I must say, the sauce was nicely seasoned and had a fine balance and good flavor. The crust seemed to be your normal premade shell, but was fresh and cooked about as well as it could be done. The cheese was a nice blend that made the whole thing work. The pizza was really a nice compliment to the spicy wings, and I would recommend grabbing a tray to enhance the experience. I also recommend dining in and enjoying the casual environment that is a great place to catch a game. 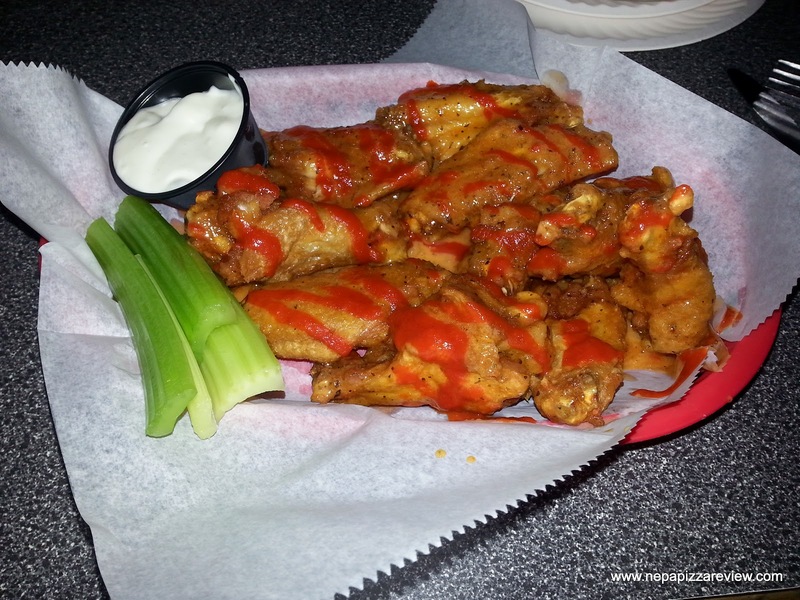 The bottom line is, the pizza is decent, but the wings are dynamite which is probably exactly what Town Tavern is shooting for!